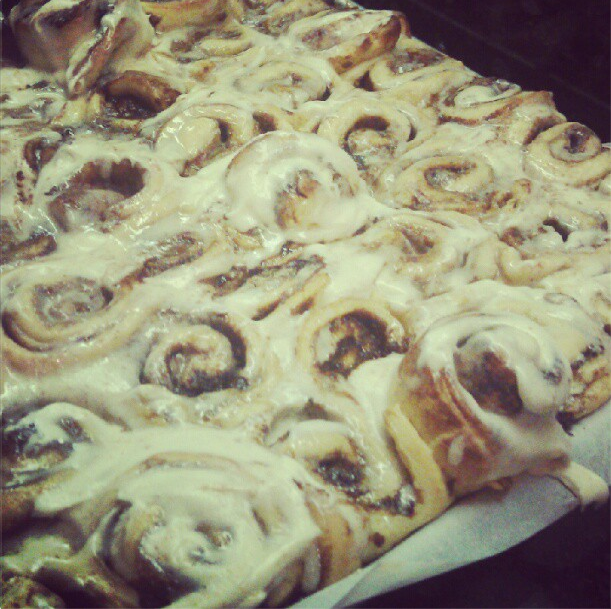 BEST Ever Cinnamon Buns - Kosher In The Kitch! 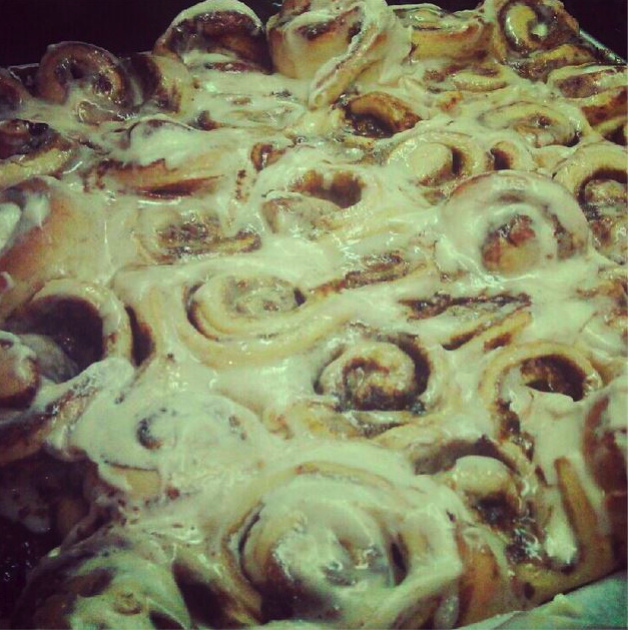 BEST Ever Cinnamon Buns - Kosher In The Kitch! I recently moved to L.A. and if I am perfectly honest with you all, these buns are definitely among the top 5 reasons I decided to make the West Coast home! My sister bakes these buns every couple of months and they are incredible. It takes some effort, which is why I don’t actually make them myself but rather wait for my nephews to beg her for some and then grab one (ok, 3) for myself! Know that if you bake these, they will not last more than 10 minutes out of the oven. I am being completely serious, they are THAT good. Also, freeze some and send them my way. Again, totally serious. The recipe makes 2 1/2 lbs dough and which makes about 30 buns. Butter (I use margarine)melted 4 tablespoons. If you are using a bread machine put it on the dough/pizza cycle, otherwise mix the ingredients in a mixer. After the dough rises (about 2 hours) divide it into 2 pieces and roll it out into rectangle shapes. Then prepare the filling and spread out on the dough. 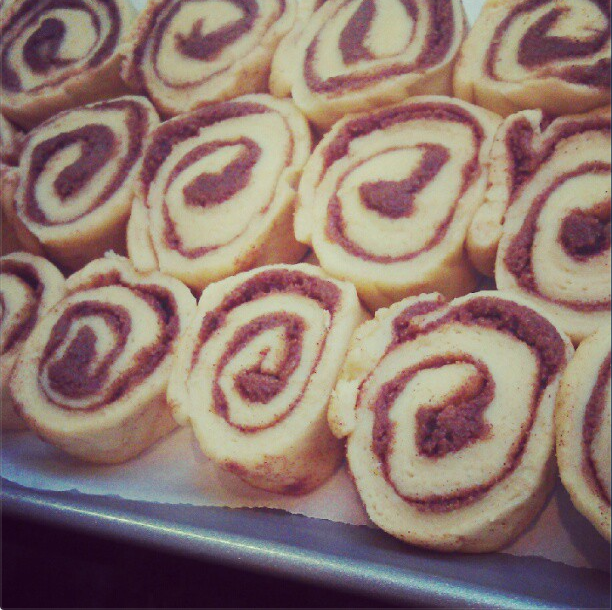 Once the filling is on the dough, roll the dough into a jelly roll and cut into equal portions and lay them in a Pan and let then rise a second time for a little bit. (ab/;out 30 minutes) Then bake on 350′ for about 20-25 min (be careful to watch them and take them out as soon as they look ready because they taste better slightly under baked!) While the buns are baking, prepare the I make confectionery sugar glaze. Follow the directions on the back of the confectionery sugar box which is margarine, confectionery sugar, soy milk and vanilla extract. To make the consistency thinner, add some water. Chicken CacciatoreApple Pie Egg Rolls BAKED not Fried! Picture and recipe look great, I’m not a big cinnamon fa, so I think I’ll substitute it with extra vanilla flavour. These are delicious! I also thought my dough wasn’t rising, but I made them anyway as I didn’t want to waste all the dough, and I (and my family) are so glad I did make them! Next time I’m going to have to double the recipe! These were all gone soon after they came out of the oven. They are that good. This is a great and easy recipe, not too over the top gooey but just the right amounts of everything. I even went less on the sugar in the filling.